Long before the official negotiations to end apartheid, there were secret discussions that paved the way for dialogue between the African National Congress and the South African government. 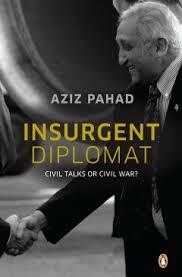 Aziz Pahad played a key role in these discussions, and in this book he provides the first account of them from the ANC’s perspective. Pahad recounts his early years in South Africa, which informed his political ideology, as well as his time in exile in London. He gives insights into the leadership of 00inspirational figures, such as Yusuf Dadoo, Oliver Tambo and Thabo Mbeki, and describes the central role played by the ANC in rescuing the country from the brink of disaster. There are also important lessons for governments still resorting to military aggression to resolve conflicts by showing that honesty, mutual understanding and compromise are essential to bringing an end to instability. A moving memoir about a significant historical period, The Insurgent Diplomat draws on the author’s experiences as one of the ANC’s most trusted politicians, who contributed to a free and democratic South Africa.